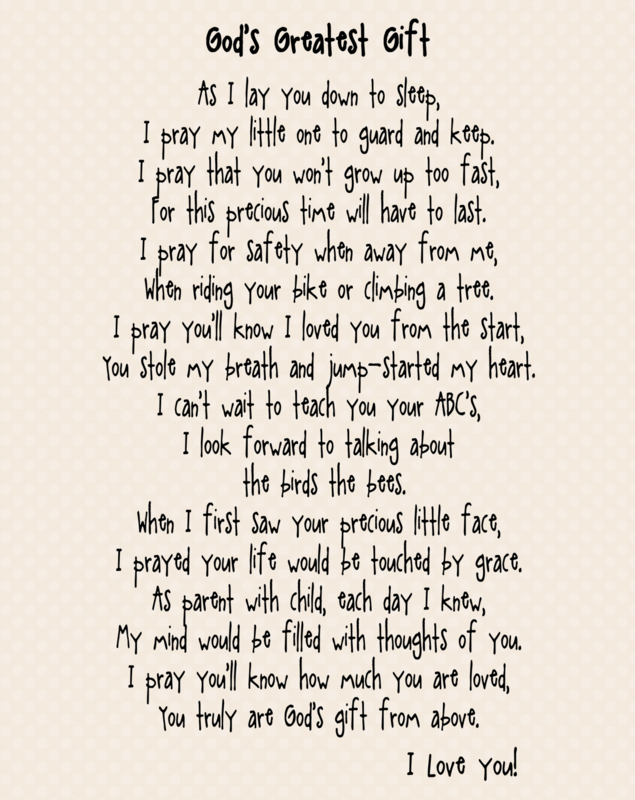 Goes with Pattern #331 "God's Greatest Gift"
As I lay you down to sleep, I pray my little one to guard and keep. I pray that you won’t grow up too fast, for this precious time will have to last. I pray for safety when away from me, when riding your bike or climbing a tree. I pray you’ll know I loved you from the start, you stole my breath and jump-started my heart. I can’t wait to teach you your ABC’s, I look forward to talking about the birds the bees. When I first saw your precious little face, I prayed your life would be touched by grace. As parent with child, each day I knew, my mind would be filled with thoughts of you. I pray you’ll know how much you are loved, you truly are God’s gift from above.